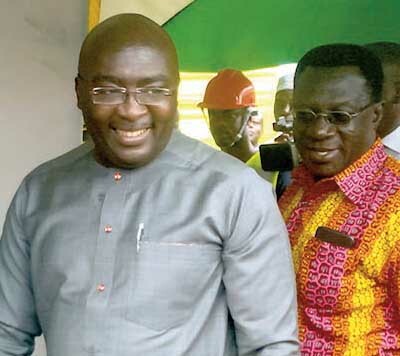 The Vice-President Dr Mahamudu Bawumia yesterday cut the sod for the start of the construction of the Western Corridor Fibre Optic Infrastructure Project at Takoradi in the Western Region. The Western Corridor Fibre Optic Project, which would cost $42 million, is a private sector-led initiative by Spectrum Fibre Company, a wholly Ghanaian owned Special Purpose Vehicle (SPV) set up to execute the project. The completion of the project would ensure local communities, government business and key sectors operating within the Western Corridor of the country have access to fast, reliable and affordable broadband network services. It would also provide easy access to broadband services which would provide new opportunities to businesses, schools, homes and the nation at large. The project, expected to create 12,000 direct and indirect jobs during the construction phase, would involve the development, finance, construction and operation of an ultramodern back haul and broadband communication infrastructure. It would cover the Western Corridor of Ghana to enhance service provision and other electronic services (e-services) required under the national Information, Communication Technology for accelerated development policy. The Western Corridor project would involve the laying of about 881 kilometres of in-land fibre optic cables for an extensive broadband network through major towns such as Takoradi, Atuabo, Elubo, Enchi, Amoya, Asawinso, Sefwi Wiawso, Awaso and Bibiani. The project would be carried out by Spectrum Fibre Company and Huwei, and it’s expected to be completed within 18 months. It would further connect some major towns in the Brong Ahafo, including Goaso, Berekum, Sunyani and would complete the loop in Kumasi in the Ashanti Region. Dr Bawumia mentioned that communication technology is expanding at a fast speed and Ghana could not afford to stay behind. That, he said, explained why government was investing a lot in modern technology. He indicated that government was poised to formalize the economy through digitization and leveraging of Information, Communication Technology (ICT). He indicated that in April this year, the Denmark government handed over the Eastern Corridor Fibre Optic Network Extension Project to the Ministry of Communications. The project, which connects the Eastern Corridor Optic Fibre from Ho to Accra, links about 120 communities along the route. “At that ceremony, the Minister of Communications made it clear that with the Eastern Corridor fibre in place, we need to complete that loop around the country and that requires working on the Western Corridor and the offshore fibre links”, he added. The Vice-President, therefore, pointed out that the execution of the Western Corridor fibre project falls in line with government’s plans to expand ICT as an enabler of change connectivity, ease of doing business and economic enhancement. Dr Bawumia was happy with the role that Ghana Infrastructure Investment Fund (GIIF) played in the project. He explained that the government established GIIF to help Ghana develop commercial viable infrastructural projects through private sector participation and support private sector solutions and financial. “It is very gratifying to see them respond to this challenge by working with the local Ghanaian sponsors to provide this critical communications infrastructure. ”This is a home-grown solution and I look forward to seeing many more GIIF-led examples of this, going forward,” the Vice-President indicated. The Chief Executive Officer (CEO) of GIIF, Solomon Asamoah, noted that ICT is a principle source of growth and job creation and that the project would therefore contribute to the country’s transformation because of the various anticipated project outcomes. Prof Christopher Ameyaw-Akumfi, Board Chairman of GIIF, added that his outfit was proud to support the Ghanaian sponsor group to boost the local economy. Frank Osei-Wusu, who spoke on behalf of Spectrum Fibre, mentioned that the company would contribute its quota through continuous innovation and investment in critical ICT infrastructure that provides bedrock for active commercial participation. The Western Regional Minister, Dr Kwaku Afriyie, said the project would create jobs for the people of the region, provide easy access to quality education and enhance mining and the oil and gas industries.